Ten millennia have passed on Earth. During this time the world went through an apocalyptic period whereafter vampires became the rulers of a rather feudal-like and less populated Earth than our current one. However the vampire’s reign has come to an end with the people revolting due to their predatory nature. Bounties were put on their heads and a class of bounty hunter evolved to rid the Earth of their kind. The Elbourne family arrange a meeting with the vampire bounty hunter known as “D”. Not exactly a friendly affair, the family has their employees train their guns on him at all times. They know D is a dhampir, the offspring of a father who was a vampire and a human mother. The family’s daughter, Charlotte, has been apparently abducted by the vampire Baron Meier Link. Desperate to get her back all costs, they offer a handsome sum which D says will not be enough, and that she may already have turned into a vampire. Though the eldest son is angered by this, the father intervenes and concedes that he would like D to end her life if that indeed is what has happened to her. To complicate things further, the family then inform him that they have also hired the infamous bounty hunters known as the Marcus Brothers. The Marcus Brothers are already hot on the trail of Baron Link’s horse drawn carriage. Driving though a small town in their armoured truck, they discover the Baron has already passed though and the entire population have been transformed into zombies. However the Baron’s minions are absolutely no match for the bounty hunters who dispose of them in a few hectic minutes, despite the zombies attempting to ambush their truck. The leader of the hunters, Borgoff, hears a cyborg horse galloping closer to them. He fires one of silver arrows towards the sound, upon which we learn is D, who catches the arrow barehanded and snaps it in half. After a brief and terse greeting between the two bounty hunters, D leaves to hunt down the Baron, with Borgoff unconcerned that he now has competition in rescuing Charlotte. The only woman in the group of bounty hunters, Leila, decides to take off on portable motor bike in an effort to beat D. Soon after, D manages to catch up with Baron Link’s carriage inside a tunnel. In the ensuing fight D hears Charlotte call out to the Baron and realises something is wrong with the situation. The Baron manages to overpower D and escapes. The following evening, D has caught up with the carriage, which is protected inside a mirror-like barrier. While D tests the defences of the barrier and attempts into find a way in, Leila arrives on the scene and immediately begins her attack on the barrier. In the ensuing chaos the baron makes his escape and Leila is badly injured. Initially content to leave her there to die, D has second thoughts when she calls out for her mother. He tends to her wounds, something that Leila is confused about and outwardly at least, not even the slightest bit appreciative of. It soon becomes apparent that Baron Link is headed towards the lands where a monster clan called the Barbarois live. Someone has paid big money to hire the clan of mutants to protect him. Though D seemingly has no problem dealing with the minions sent by the head of the Barbarois to kill him, the ones protecting the baron’s carriage are different story. The trio of mutants start to pick off the Marcus Brothers one by one. But soon D arrives and along with the Marcus Brothers they soon manage to even up the score, though with their ranks heavily depleted. Both D and the remaining bounty hunters in the Marcus Brothers discover that Baron Link’s carriage’s is headed towards Castle of Chaythe, home of the “ghost” vampire Carmilla. But why would Carmilla pay the Barbarois clan to protect Baron Link and Charlotte? For whatever reason, I have sort of ignored this film, or missed it. I first came across it when it was screening at the very first Japanime film festival back in 2000 as part of a larger arts festival being held in Sydney as part of the 2000 Sydney Olympics. I had a chance to go to the festival, but passed it up. A couple of years later, the now defunct US anime video label Urban Vision released the film on DVD and later promised to release another version, this time with the Japanese dub (yes, the original version of the film was the English version). I waited for its release, but of course this never eventuated. Eventually I forgot all about the film. Backtracking a bit, I should explain this film was released in Japanese cinemas with the same English dialogue version as presented on this disc (with Japanese subtitles of course). When it hit home video over there, it came in the theatrical English language version with Japanese subtitles and separate, newly dubbed Japanese version. I really have no idea why this happened. The original English version was a ploy to get it into US cinemas, apparently. The version released in Japanese cinemas also differs from the English language home video version with Japanese pop band Do as Infinity providing a closing theme rather than the music score by Marco D'Ambrosio. 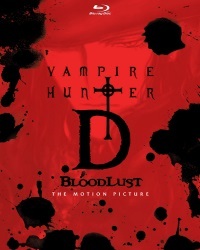 Also despite what Wikipedia or any other source tells you, the subtitle “Bloodlust” does not appear on any Japanese publicly material, merchandise, any home video version or on the film’s title card. It’s just called “Vampire Hunter D” over there. Based on “Demon Deathchase” (originally called “Wandering on Death Row”), the third novel in Hideyuki Kikuchi’s “Vampire Hunter D” series, it certainly puts Toyoo Ashida’s (“Fist of the North Star”) 1985 movie adaption to shame (and it WAS a movie. The Eirin mark on the title card, movie programmes, movie trailers etc, prove this. Please stop calling it an OVA!). Directed by Yoshiaki Kawajiri, of “Ninja Scroll” and “Wicked City” fame, unlike the 1985 film the character designs, while most certainly have Kawajiri’s distinctive style stamped all over them, are very sympathetic to Yoshitaka Amano’s originals. Like most of Kawajiri’s works, the action is kinetic and an absolute joy to watch. The story holds up really well too with a theme of doomed love sort of playing out on two fronts, as well as a secondary plot which looks at the dueling humanity and base vampire urges that both D and Baron Link struggle with. The film is just gorgeous to watch. Kawajiri paces the film beautifully. The film does make use of CG, but surprisingly it’s mostly unnoticeable. Nothing really sticks out and screams “this is CG”. It’s blended very well and the use of 35mm shot cel animation is apparent though filming artefacts. The film does have its share of problems and of course the biggest one is the English adaption. Most of the acting and dialogue is pretty good. Where it falls down is some of the throwaway corny lines or the addition of additional lines of dialogue where there would be silence in a Japanese film. Over explanation through dialogue is one of my pet peeves of blockbuster Hollywood films. I thought Mike McShane, who plays D’s talking symbiotic left hand (he calls himself a “parasite” in the film), was miscast. But this is probably more due the fact his character is written as coward-like at times rather than the cold, sardonic, almost evil creature he is in the novels and 1985 film. Marco D'Ambrosio's score is mostly fitting and excellent at many points in the film. However at it occasionally devolves into a cheap sounding synthetiser track which sounds like it belongs on some B-grade direct to video film. But putting aside those criticisms, this is a bloody good film. I can’t believe I ignored it for so long. I think the shoddiness of the original 1985 film had done a lot of damage in how I viewed the franchise. Discotek’s blu-ray is pretty good considering the apparently poor quality of the source material. The film still hasn’t received a BD release in Japan (only out of print and hard to find VHS and DVDs from 10+ years ago exist) which is a shame. I would love to hear the Japanese dub, but I don’t think that’s ever going to happen on a commercial English language release. A new “Vampire Hunter D” TV series is apparently in production, but I think it’ll be hard to beat Yoshiaki Kawajiri’s film. I’ll give this film a solid 8 out of 10. Remaining Backlog: Six series, 16 movies, two OVAs also waiting for second parts for two shows to be released before viewing them.